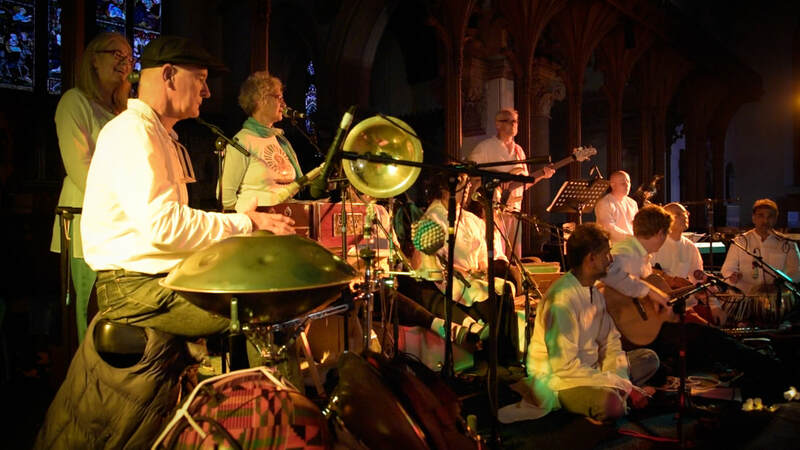 Welcome to Sacred Sounds, a space to explore some of the fabulous musicians, performers and workshops leaders who perform at Stroud Sacred Music Festival events throughout the year. 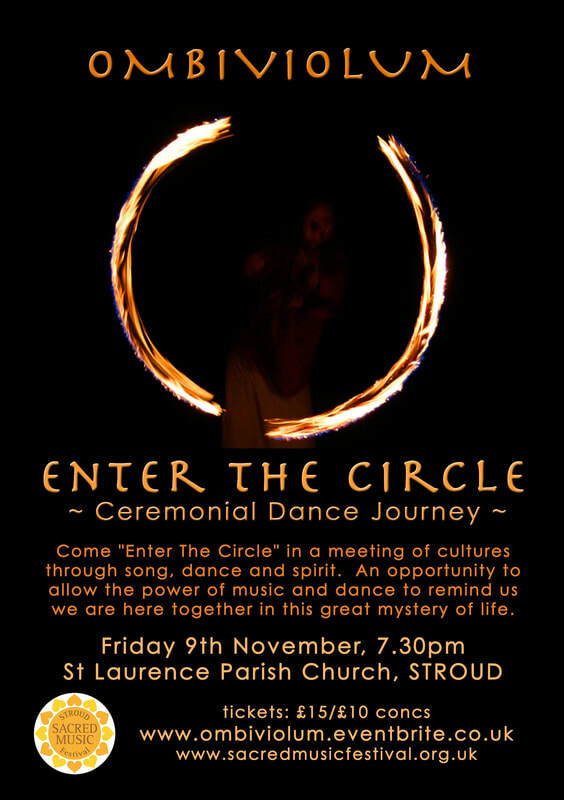 For several years now, Stroud Sacred Music Festival has been collaborating with Enchanting the Void in its morphing shapes and forms brining inspiration and illumination to the visitors and organisers alike. Last year JJ & friends closed the festival with a their unique blend of meditation and earth chant, this year along with Maggie Moon Rose (who features on their most recent CD On Wings of Song) Enchanting the Void held space in the chant venue of the festival, singing throughout the day alongside musicians of various other faiths and devotions. Enchanting the Void is a deeply earth based form of chant, JJ describes this as 'singing the land alive though prayerful devotion' alongside 'spacious periods of stillness' that resonate with the land, ourselves and the wider community. Coming to St Laurence on the 9th of November, this highly original 9 piece orchestra brings a twist of western folk and classical elements into traditional Zimbabwean mbira music. Ombiviolum’s soundworld is based on the polyrhythmic patterns of the mbiras locking in, their haunting sound rising amongst the buzz of shells and bottle tops, the irresistible pulse of the black seeded hosho shaker, your ears hearing things that aren’t there... An oboe floats high above the rich percussive texture. Then the strings take off, the groove thickens, folk melodies merge with mbira lines, 4 -part harmony singing, percussion and virtuoso dance. A true master of the kora – the West African harp - Seckou, from the Casamance area of Southern Senegal, was a childhood prodigy, born of a line of griots and kings. He has arguably become the most influential and inspiring kora player of his generation, an exceptional and charismatic musician. 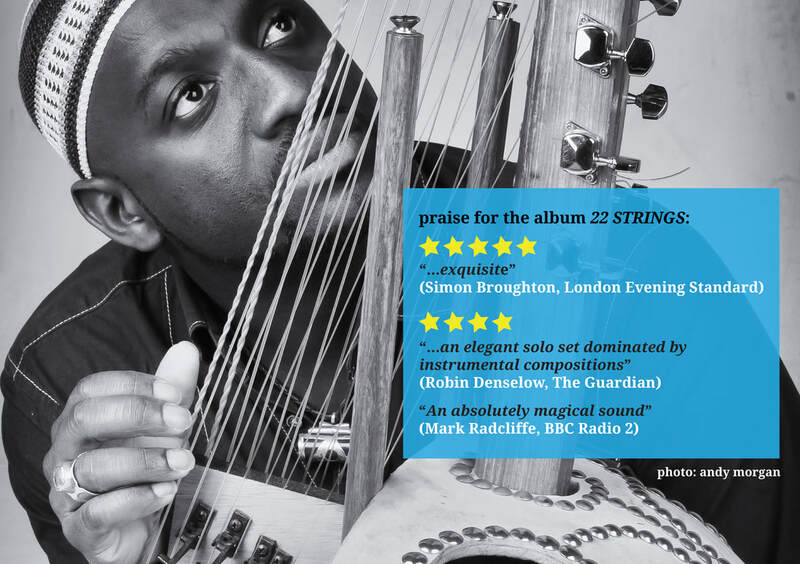 In his latest album 22 Strings, Seckou explores what it means to be a modern global citizen, and yet to live with seven centuries of tradition and heritage expressed through music. He gives us the kora in its purest guise, a wondrous instrument that can soothe the bloodlust of warriors and take the human spirit to a place of deep meditation, stillness and beauty. Hailing from North London Natty grew up surrounded by an eclectic mix of sounds from Neil Young to Bob Marley. Although interested enough in music to write songs from an early age it was while working in Sphere Studios, Battersea that he really discovered his talent. By day he was engineering for some of the biggest names in pop music, and by night this gave him the inspiration to nurture his own sounds. ​At this years festival, Natty will be headlining the youth and young adult event on Friday evening. From Syria, speaker, humanist and virtuoso of the qanun disseminates peace through the healing power of music. One day, aged 9, on her way to the music institute where she was reluctantly studying the violin, the taxi driver was playing a recording of an instrument that blew her mind – it was the qanun. When she told him she was determined to learn it his reply shocked her, but kindled a flame: he told her girls did not play the qanun; it was a man’s instrument played only by men. He laughed at her when she told him she would learn to play it. Now, Damascus born Maya Youssef is hailed as “queen of the qanun”, the 78 stringed Middle Eastern plucked zither. She moved to London under the Arts Council’s “exceptional talent” scheme and has played at the Proms and alongside Damon Albarn. When the war started in Syria, writing music was “no longer a choice” and that was the birth of her highly acclaimed debut album Syrian Dreams (produced by the legendary Joe Boyd). For Maya the act of playing music is the opposite of death; it is a life and hope affirming act. For her, music is a healer and an antidote to what is happening not only in Syria, but in the whole world. Maya will be headlining this years Saturday evening event with her trio of musicians. From infancy K. Sridhar was initiated into the highly structured and precise training of the Carnatic tradition by his mother, a renowned vocalist in her time. He often accompanied her when she sang for many of India's great sages and saints. He descends from fourteen generations of temple musicians including the saintly Narasimha Bhagavater of Tanjore. At the age of five, K. Sridhar began his training on the sarod under the guidance of Z.M. Dagar, an internationally known lineage bearer of the traditionally classical and devotional Dhrupad style within North Indian Classical Music. ​At this years festival Sridhar brings his exquisite sounds to Stroud in a not to be missed performance. Joe is a singer/songwriter from Cornwall, who grew up with folk songs, a folk club and festival visits with the family. Later moved to London to study English and poetry and continued to write and sing songs and be in band projects. Taking inspiration from peace activism and social justice involvements, Joe started the Peace Sounds label project in 2012 and has also spent a recent 6 months residency of song/recording projects in The Plum Village monastery, the home of monk and peace activist Thich Nhat Hanh. Joe also draws inspiration from Quakers which he attends. Joe is currently recording an album of own songs and keeping an online journal on peace and song. Listen to some of Joe's tunes below. Matthew will share some original and traditional chants to evoke the beauty and power of mountains, rivers and forests, and will draw on the timelessness of ancient chant in weaving a magical and contemplative tapestry of sound using piano, clarinet and voice. Your presence and participation is warmly welcome for a multi-faith exploration of the unifying power of sound. Matthew is a local musician, teacher and composer, who believes passionately in the power of music to touch the heart and move us deeply. He seeks to share his love of music through regular classes for adults in Music Appreciation and a one-to-one teaching practice in piano and clarinet. As featured on BBC 6 Music, local group Faeland fuse deep folk roots with beautiful acoustic instrumentation (guitars, Celtic harp, violins, accordion, double bass) bringing their innovative and gently experimental approach to contemporary music. The songs, steeped in ancient folk lore and sacred Earth tradition, are fast gaining a reputation for moving and transcending audiences across the globe. Faeland’s music is influenced by music from both sides of the Atlantic, giving the band's personal spin on classic themes of humanity, such as love, healing, and magic. Despite tackling difficult themes and life experiences, there is a strong vein of optimism running through the music of Faeland; who are fully committed to making music that changes lives for the better and adding something good to human existence. Elahn Keshava & Gisela Lirusso are directors of Shekinah Yoga Retreat and ran Shekinashram, the much loved Bhakti Yoga ashram in Glastonbury UK for 14 years. During this time they ran daily and weekly programmes and retreats introducing people to the beauty and grace of the path of devotion. Having studied and practised in both eastern and western mystical traditions they synthesise their different influences into a unique blend of bhakti yoga and andean shamanism. They regularly travel internationally with their daughter Tulsi sharing kirtan journeys. Sharing with us joyful Kirtan to sing, move or meditate to, Radhe Sham. We chant and sing sacred mantra and songs of devotion from a variety of spiritual traditions,. 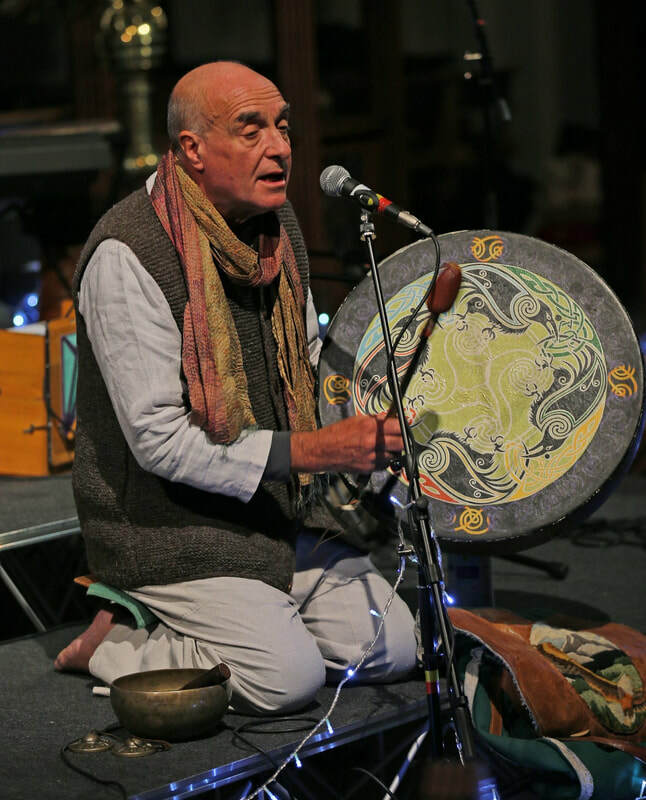 At the Stroud Sacred Music Festival we will be focussing on those from the Sikh and Buddhist faiths. We will also be singing simple, fun and inspiring songs and chants for children. A collective from many walks of life and backgrounds. What brings us together is our love of devotional sounds from around the world and collaborating with our music when we perform to our audiences in Stroud. It’s the integration of our individual spirituality to the bigger harmony that manifests our music into songs that celebrate joy and wonder. The audience complete the performance with dancing, singing or contemplative listening. We have only one desire, to awaken the heart centre. Featuring sitar, tabla, acoustic & bass guitars, harmonium, violin, percussion, dholak, darbuka, hang, pipes and voice we are a unique 15 piece band based on World Fusion Devotional music with ancient and contemporary sounds specifically for dancing. Will be facilitating the Shamanic Drumming Ceremony calling on natural spirituality in honour of the earth and the sacred feminine. Bring Frame Drums and/or your voices and feel the energies of the earth come up through your feet and flow through your frame drums and voices. Come and connect through sound with all that is, offering prayers and gratitude. Open to all men, women, children. Kate Dineen is trained in a 16,000 year old tradition of natural spirituality from the Andes, Peru. Trained as a healer and celebrant, she regularly holds fire ceremonies, despacho ceremonies and one-to-one Shamanic healing sessions for personal healing as well as to mark rites of passage and transitions in life and death. She made her drum with Jeannie Ireland and uses it for healing and ceremony. The drum is a powerful portal to spiritual insight and healing. Kate also teaches those who want to deepen their experience of natural spirituality. The Listening Voice; An opportunity to deepen your relationship with your singing voice and your inner listening through a simple introduction to the notes of the Indian musical scale (sa-gam), and the deep connections it holds. Liz is an experienced musician and teacher. Following a western classical training and since having explored many approaches to music, the voice, and listening. Finding great freedom and inspiration in working creatively, particularly around the Indian raga scales. The Dances of Universal Peace are a joyous, multi-cultural and experiential celebration of the sacred in ourselves and in the world. We dance in a circle using simple movements and phrases from the world's wisdom traditions. Many find the dances to be a wonderful tool in deepening our connection to ourselves and to others. ​The dances are suitable for all - no experience needed. Come and join us! A multi-faith/no faith gathering to which everyone is welcome. This event is held monthly at Open House Hall in Stroud and we will follow our usual format. We begin with 15 mins silence, a chance to sit quietly in meditation or reflection. You are welcome to arrive quietly during the silent time. The silence is followed by singing, poetry, dancing and music, often with an interactive activity or ritual. It is a participative event of a spiritual nature, which draws on different sacred traditions but is not aligned to any particular faith. The theme for this meeting will be Community. 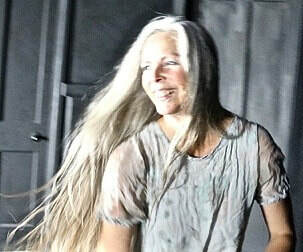 Dawn Morgan has taught movement and dance for 25 years, her background includes trainings in 5 Rhythms & Somatic Movement. Sacred Dance: Body, Breath & Gesture - is an invitation to nourish and inspire the creative embodied self. All are welcome, come and move and honour the whole self as sacred. You will be guided gently into free movement with a selection of exquisite music. Amelie Saville and Esther Browning are a local violin duo and will be performing as part of the Friday night youth and young adult evening.